Arsha Kulam is a non-profit organization dedicated to the traditional teaching of Advaita Vedanta. It was founded in 1982 by Radha (Carol Whitfield, Ph.D.) under the auspices of Swami Dayananda Saraswati at the same time Arsha Vidya Pitham was established. 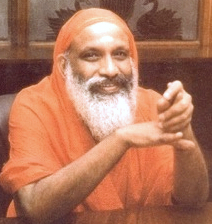 Arsha Vidya Pitham is the parent organization of Arsha Vidya Gurukulam, Institute for the Study of Vedanta and Sanskrit, located in Saylorsburg, Pennsylvania. Online classes are conducted through Zoom.us and may be accessed by clicking this link. Follow the prompts to enter the meeting. Once in the meeting room, please mute the microphone icon to the right of where your name appears on the attendees list.t. Choose “Join a meeting”, enter: 9761257828. Follow the prompts and select “Join”. Once in the meeting room, please mute the microphone icon to the right of your name on the attendees list. iPhone/Smartphone one-tap: 14157629988,9761257828# or dial 1.415.762.9988, then enter access code: 9761257828#. Once in the meeting, please press the mute button on your phone.